What are the Latest Elliptical Workout Tracking Programs? Not too long ago, if you wanted to keep track of your elliptical workouts, you either kept all of your stats in your head or wrote them down in a notebook kind of like a personal trainer does at the gym. This was just fine, and many people still use these methods today despite all the advancements in technology. But there’s a much easier way to monitor your progress on your elliptical machine from one workout to the next, and it all happens automatically without you having to remember anything or write anything down. It’s called workout tracking, and more and more brands are offering this capability. In fact, soon enough this will be a standard features, as companies compete to give users everything they are looking for. If you’ve used an elliptical trainer at the gym, you might already be familiar with workout tracking. Companies like Octane and Life Fitness offer you the ability to log into your account and see all of your workout information. You can see what you did previously, set goals for yourself, compete against your personal bests…it’s a way to gauge your performance over time, which is an important part of working out. You should be improving over time, especially if you work out consistently. Fortunately, makers of residential ellipticals have recognized the importance of this technology and have slowly brought workout tracking capability to the home market. Now, many brands give you the ability to track and share your workouts. Let’s take a look at who offers what…. The pioneer in workout tracking for the home market is definitely ICON Fitness, the largest cardio equipment manufacturer in the world. They introduced the iFit program, which has workout tracking capability as well as a number of additional features such as additional programming, Google map destinations, nutrition recommendations and more. The iFit program automatically keeps track of your workouts…distance, time, calories, incline, etc. and stores the information in your account. It does so via Bluetooth on some machines and on the machine itself on more advanced models. Note that iFit does require a yearly fee, but it does offer you so much more than just tracking your workouts. One of NordicTrack’s main competitors, Sole Fitness treadmills now come with Bluetooth tracking capability. It took them quite some time to jump aboard the tracking bandwagon, and that was one of the few complaints about the company. But now all of their ellipticals and treadmills have workout tracking. With Sole, your workout results sync via Bluetooth technology to your smart phone or tablet. You can use the Sole app or transfer the results to a number of different popular fitness apps such as Apple Health, MapMyRun, Fitbit or Record. 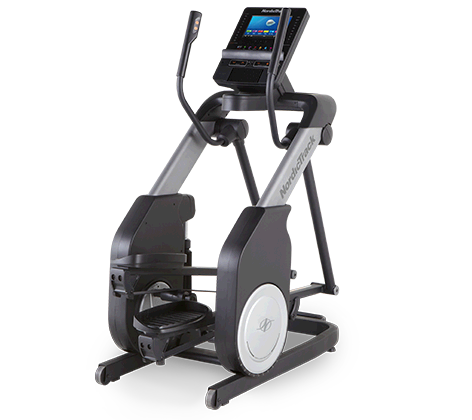 Similar to what Sole offers, Horizon and Matrix has a program called ViaFit on all but the base model EX-59 elliptical. However, rather than Bluetooth the ViaFit program works through your WiFi network to record data and sync it to any fitness program or wearable that you choose. You can set goals, challenges, gain rewards and share your results with friends and family. Although not available on all Life Fitness ellipticals, the company does offer Discover, Explore and Track Connect consoles on some models that have tracking capability along with additional workouts, app integration and other enhanced features. The LF Connect app operates via Bluetooth like on the Sole machines and via LF Connect and a number of popular apps such as SoFit, EveryMove, Kinomap, RunSocial and other platforms. Some of the higher end ellipticals from Precor have Preva, which is a workout tracking system with some special features, similar to what Life Fitness has to offer. There aren’t too many models currently that actually have this capability. All of the Nautilus brands offer some kind of tracking capability. There’s the Bowflex app, available on the Max Trainer, TreadClimber and traditional elliptical and treadmill models. There also something relatively new called the Max Intelligence App, which is a subscription based program with workout tracking, customized programs and Run Social integration, among other enhanced features. You also have the Schwinn Trainer 2 App and Nautilus Trainer 2 App, offered on their up-level models. Octane has SmartLink, with a new 3.0 version on its way soon. Do any elliptical companies not offer workout tracking capability? Most of the popular elliptical brands now offer workout tracking capability as it is definitely in demand. You typically won’t find it on cheap ellipticals, i.e. those that are under around $700, but it is on several popular models in the $800-$1000 range. Some of the more well-known brands that don’t currently offer tracking as of this writing are Xterra, Stamina, Sunny Health & Fitness and Diamondback. That will likely change over time. So chances are if you are looking for one of the best ellipticals on the market it is very likely that you will be able to track your workouts, especially if it is one of the more expensive models. If you come across an elliptical that you absolutely love and it doesn’t give the ability to track workouts, don’t let that keep you from buying it. It’s definitely a very nice perk but it’s not a total deal breaker unless you absolutely need to monitor your results from one workout to the next. You can always do it the good old fashioned way…writing it down or simply remembering your results from the last time.